The plain bearing market has been growing at a steady pace due to the increasing demand for motor vehicles, oilfield machinery, and construction work. A wide range of equipment used in the energy, aerospace, railways, automotive, farm and gardening, construction, and oilfield sectors make extensive use of plain bearings. The primary factor driving the growth of the global plain bearing market is the growing demand for motor vehicles worldwide. In addition, the rising demand for bearings in the defense and aerospace sector is aiding the growth of this market. Rising technological innovations are, however, making these bearings more durable and this hinders aftermarket sales. The growing number of counterfeit products is also hampering the growth of the plain bearings market globally. On the bright side, the introduction of smart bearings is expected to provide new opportunities manufacturers of plain bearings in the near future. 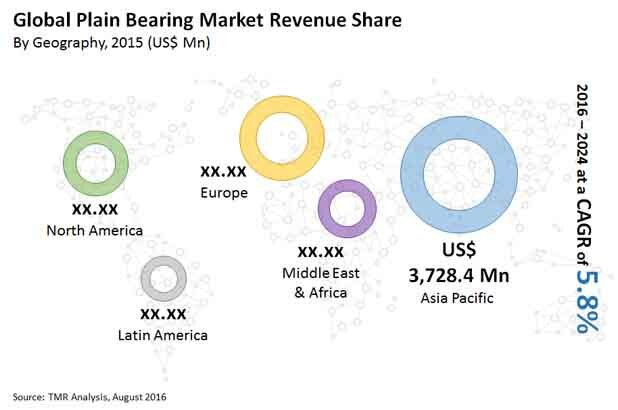 The global plain bearing market was valued at US$9.5 bn in 2015 and is expected to reach US$16.2 bn by 2024, registering a CAGR of 5.8% therein. Based on end use, the global market for plain bearings is broadly bifurcated into the automotive and industrial sectors. The industrial sector is further segmented into chemical, agriculture, food and beverage, pulp and paper, aerospace, and others. Recent trends show that there is a steady year-on-year rise in the production of motor vehicles and thus the automotive industry accounts for a considerable share in the plain bearing market. In the industrial segment, the construction sector holds a major chunk of the market in certain regions. In addition to the construction sector, oilfields and the aerospace industry are expected to contribute to the growth of the plain bearing market during the forecast period. Geographically, Asia Pacific has been leading the plain bearing market and is expected to retain its lead throughout the forecast period. Continuous urbanization and the growing demand for automobiles in developing countries such as India and China is driving the Asia Pacific market. In addition to this, the falling prices of bearings bode well for the market in this region. South Korea, Taiwan, Singapore, and Japan have also been witnessing rapid growth in the automotive sector and many plain bearing companies in these countries are opening up manufacturing facilities in order to cater to the growing demand. The rising demand for infrastructure development is boosting the use of plain bearings in the construction industry, TMR finds. The Rest of the World segment includes the Middle East, Africa, and South America. The Middle East has proven to be a lucrative region for the plain bearing market owing to its thriving construction and automotive industries. In 2012, NSK opened its new branch NSK Bearings Gulf Trading Co. in Dubai, UAE. Countries in the African continent, such as South Africa, have been observing an increased level of industrialization and this is expected to boost the demand as well as market for plain bearings in the coming years. South America is mainly dominated by Brazil and has several conducive factors contributing to the plain bearing market in the region. The ongoing development in the construction sector is the primary demand driver for journal bearings. The global plain bearing market is flourishing due to rising demand for machinery, motor vehicles, construction of buildings and offices. Industrial growth in the sectors of energy, oilfield, gardening, construction are leading to the demand for bearings. Such industries uses heavy machineries that rises demand for bearings. These sectors are expected to grow during forecast period. Thus, taking the global plain bearing market to next level. A lot of opportunities are expected bearing market worldwide. Transparency Market Research illustrates about the analysis, trends, growth, and completion during the forecast period. It also talks about the regional demand and market for plain bearing during project period. Spiked demand for motor vehicles, construction work, machineries are expected to push the market growth for plain bearings. Aerospace, Armed forces sector will boost the demand further. Construction sector is anticipated to hold the market during the forecast period. Furthermore, automotive industry uses plain bearing on a large scale. This will further swell the market for global plain bearing market. Several types of bearings exist in the market namely, roller bearing, jewel bearing, and fluid bearing. It is also projected that defense, oilfields and aerospace sector will also contribute market expansion. Rapid urbanization is another factor that aids the growth of plain bearing market. Due to rapid urbanization there’s always a demand of better infrastructure. This in turn is projected to boost up the global plain bearing market. These bearings will be cost effective, which will further push the market. Besides cost effectiveness, these bearings are likely to be efficient as well. These bearings are anticipated to carry heavy loads due to high precision. Agriculture sector too is like to boost the market for bearings. Bearings are used in gardening as well. Thus, global plain bearing market will grow substantially during the forecast future. Aforementioned factors will prove beneficial for plain bearing market during project period. Durability of these bearings will act as a restraint in market growth. However, the brighter side is due to technological advancement smart bearings are also expected to hit the market soon. In terms of regional distribution, Asia Pacific is expected to rule the global plain bearing market. Asia Pacific is foreseen to have a lucrative demand for the market. Countries like Taiwan, Singapore, Korea, and Japan will see substantial growth during forecast period. Middle East, South America, and Africa falls under rest of the world. Middle East is anticipated to see a flourishing market for bearings due to infrastructural development in this region. South America is expected to see a lucrative market during the forecast period. There are large number of players across the globe. These players will adopt various strategic methods to sustain in the increasing market completion. Key players are projected to apply number of organic and inorganic strategic methods. Mergers and acquisitions are likely to happen during the forecast period. Innovations in product line, expansion and joint ventures are likely to take place. These companies are fast growing with an intention to strengthen their position global plain bearing market. Parkeon S.A.S, IPS Group Inc., Ventek International, J.J. Mackay Canada Limited, LocoMobi Inc., Cale Access AB, Parking BOXX, METRIC Group Ltd., Worldwide Parking Inc., CivicSmart Inc., and POM Inc. are some of the major players in the global plain bearing market.